This recipe is so simple and so delicious and I am sharing it specifically for my brother who is trying to eat healthier. The following vegetables are just a suggestion. Use your imagination or use your favorites. For a family of four to serve as a main dish, just use 1 large vegetable, e.g. 1 large zucchini. Prepare the vegetables by washing them, and chopping them into large pieces. There is no need to peel the vegetables. 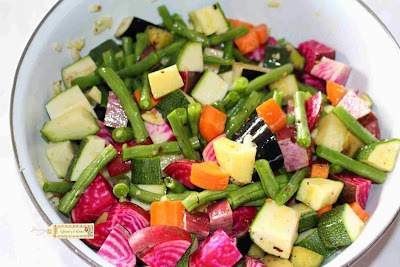 Place all the prepared vegetables in a large bowl. Add the oil, and season with salt and pepper. Make sure to all the vegetables are well covered with the oil. If not, just a little more oil. Place on a shallow baking sheet and roast in oven for approximately 30 to 60 minutes, until the vegetables such as potatoes, are cooked through and roasted. Be careful not to burn the garlic and green beans. After you remove from oven, add the crushed red pepper and your choice of vinegar if you'd like. It is not necessary but it does give it a nice finishing touch and good flavor. Serve with bread or even rice.